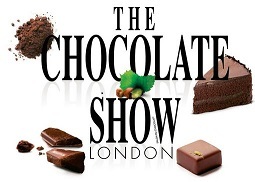 As I got a special preview of what the chocolate show is like I can tell you all about it while it is still on! Not only that but besides already having given away 3 pairs of tickets I found out that the Chocolate Show has teamed up with YPlan to offer visitors £10 off The Chocolate Show! Just download YPlan on the App Store or Google Play and enter the code: CHOCOLATE2014 for £10 credit! Of course I’d love to have a bit of an audience when I and two fellow bloggers take to the Academy of Chocolate stage at noon on Friday and Saturday to answer questions about chocolate but the show has so much to see and do! A fashion show every day at 5pm, lots of tasting sessions and workshops, and lots of stands selling chocolate. You can also download the Chocolate Show app! As well as an interactive floor plan, exhibitor lists and schedules, you’ll have access to exclusive show offers like discounts, plus the ability to plan your schedule like making sure you attend my session 😉 share your photos and create a to-do list, to ensure you don’t miss out on your favourite chocolate stars! Love the picture book, you were truly surrounded by some of the best! So lucky! Have they announced the dates for next year’s show yet? i will be there!